Nice wheels make our cars look pretty and everybody wants them. However, really nice wheels are expensive and people often buy non-genuine wheels cos it is cheaper. However, how dangerous are fake wheels? Anyway that a story for another day. Getting a flat tire is one of those motoring problems that can happen suddenly at any time (day or night) and speed, which could tend to be disastrous. Changing a flat tire can be irritating especially when one is ina hurry and even more irritating if one does not know how to change a car wheel. Learning to change a wheel can save you time and money and Motoring Nigeria is here to guide you. But before we proceed to the steps, here area few precautions you should note. * Always keep a spare wheel ready for use at any time. * Always keep your Jack and wrench in the trunk, you never know when you might get a flat tire. * Don't ever try to change a wheel on soft, loose or uneven ground. * Never work underneath a car while it's raised on a jack. * Use the jack only at the specified jacking points, attaching the jack at the wrong place can cause damages to you and the car and/or risks it falling when raised. Do not try to change a wheel on a motorway, pull over well away from the traffic, apply the hand brake, engage 1st gear and also make sure the vehicle is on flat/level ground. If you aren't in a driveway or garage, turn on your hazard lights. * CHOKE THE OPPOSITE TIRE. Choke with a large piece of wood or large rocks (front and back) the tire that is diagonally across from the one being changed to keep the car from rolling. * GET THE SPARE WHEEL, JACK AND WRENCH. Remove the spare from the boot/carrier (Most spare wheels, jack and wrench are kept in a compartment below the boot floor). Lay the spare on the ground where it will be convenient for fitting. * LOOSEN THE WHEEL NUTS. Fit one end of the wrench on to the nut/bolt and turn it anti-clockwisely (only loosen each nut about a quarter turn) but do not remove. * JACK UP THE CAR. Find your car's jacking point (an older car may just use the frame while a newer car will have two notches or tabs on the seam below the door which fits into the jack) Place the jack in place and raise the car slowly. Keep winding until the wheel you want to change is clear off the ground. If the car feels like it’s going to slip at any point, or the jack starts to lean over, stop jacking and wind the jack back in the other direction. * TAKE OUT THE WHEEL WITH THE PUNCTURED TIRE. With the wheel in the air, remove the nuts/bolts and place them where they won't roll away. Then slide the wheel off the hub, be careful with this as it might be a little heavier than you think. * FIT IN THE SPARE WHEEL. If your car’s wheel is fastened on with nuts, it will be easier to fit in. Simply match the holes of the new wheel with the stud bolts on the car and and set the wheel on the studs. 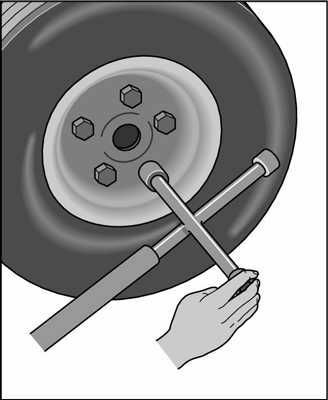 However, if your car’s wheel is fastened on with bolts, You will need to hang the wheel onto the hub without the aid of the threads, then keep it in place with your hand. * FIT IN THE NUTS/BOLTS. secure the wheel by refitting the top bolt/nut first then tighten all the nuts by hand first (Do not oil the bolts/nuts before refitting them, as this will make them more likely to work lose). Take your wrench and tighten them a little with the wheel in the air. Carefully lower the wheel to make contact with the ground. Once the jack has been removed the nuts can be re-tightened (clockwise direction). Place the punctured tire, jack and wrench in the trunk. Also replace or repair the damaged tyre as soon as possible. Was this helpful? Please leave your comments below.